It might not quite be the hottest tablet news of the day, but we managed to catch a glimpse of the Arnova "designed by Archos" Child Pad on the floor here at CeBIT. Last time we saw this slate it was nothing but a render and a few specifications, but now we know a little more. First, there's a MicroUSB port and a front-facing camera, so your little darlings can be uploading pictures to Facebook even before that pacifier has dried for the last time. There's a microSD slot too, so you can load up an extra 32 gigs of Barney re-runs, if the 4GB internal storage isn't enough. The model we saw was a special edition "Alvin" version, which comes pre-loaded with bonus chipmunk-related content, such as special themes, wallpapers and, well, you get the picture. The 7-inch, 800 x 480-pixel touchscreen is resistive -- which might be a bit of a dirty word these days -- but considering the intended audience, it's probably a fine choice. Our prods and pokes were met responsively enough, and Ice Cream Sandwich seemed to run just fine on the modest 1GHz ARM Cortex A8 processor with 1GB of RAM. Archos claims you'll get eight hours of video playback, or 16 hours of music per battery charge, and we assume that's with the 802.11b/g wireless turned off. The plastic finish actually looks pretty good, and will wipe free of jam and chips easy enough. Also, the back has a rubberized feel that should help prevent it from slipping from those juvenile paws. It's penciled in for release in April, and the real kicker here is the price. The €99 (about $129) price tag might not quite be pocket-change, but it's pretty darn close. See Alvin and our hands-on after the break. 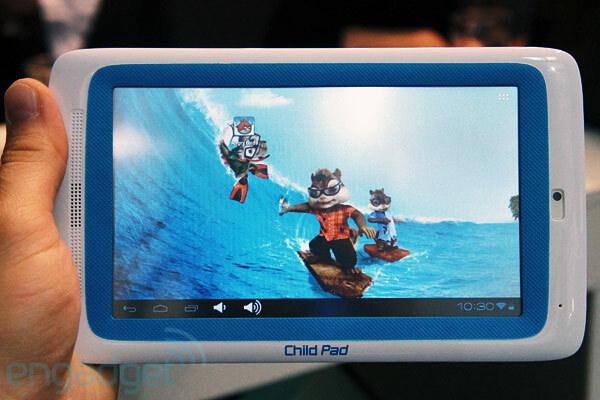 Archos Arnova 7-inch Child Pad hands-on (video) originally appeared on Engadget on Wed, 07 Mar 2012 09:39:00 EDT. Please see our terms for use of feeds.